Lynchburg-Clay’s Brooklyn Layman jumps into the air to hit the ball on Tuesday at Lynchburg-Clay High School where the Lady Mustangs took on the Lady Astros of East Clinton. 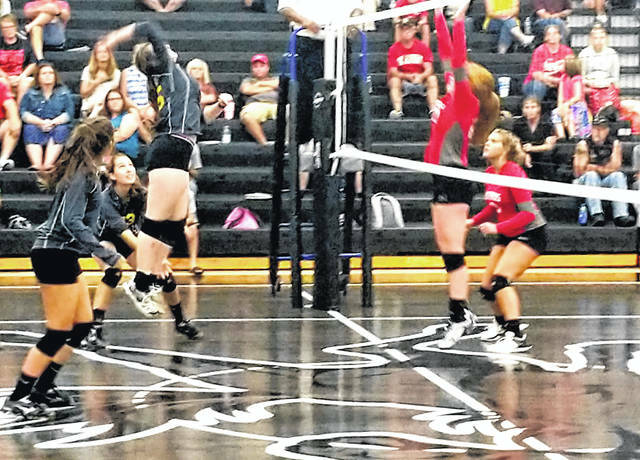 Lynchburg-Clay’s Lady Mustangs fell behind 2-0 to the East Clinton Lady Astros on Tuesday at home before rallying and taking the final three sets of the match to register the come from behind win. Mark Faust, the head coach of the Lady Mustangs, talked about the struggles of the team early in the 2018 season. “Last Tuesday night at Greenfield we were within one point of going up 2-0 and lost, Friday night at Eastern we won the first two sets and lost the final three, and last night at Paint Valley we won the first set and then lost the match. We have been in that situation and I think the girls decided they didn’t want to do that anymore they wanted to be on the other end,” said Faust. The Lady Mustangs were dominated in the first two sets as they Lady Astros easily won by scores of 25-6 and 25-16 respectively. In the third set the girls from Lynchburg-Clay appeared to turn the script on the Lady Astros as they worked their way to a lead, behind strong hitting by Amber DeBoard and Brooke Layman, and never looked back as they claimed a 25-19 third set win. East Clinton looked to be in control at the midway point of the fourth set as they held a 15-12 advantage and forced Faust to call a timeout to regroup. Lynchburg-Clay battled back and tied the game at 17, 19 and 20 apiece before taking a 21-20 lead that forced the ladies from East Clinton to call a timeout of their own. Following the Lady Astros’ timeout the teams traded points until East Clinton gained a narrow 26-25 lead with the serve and Lynchburg called their second timeout of the set. Again the teams traded points but this time it was the Lady Mustangs who gained the advantage at 28-27 and control of the serve. Following a second timeout by East Clinton the Lady Mustangs finished off the set 29-27 and tied the match at 2-2 and forced a deciding fifth set. The Lady Astros jumped out to 5-0 and 10-5 leads each time forcing the Lady Mustangs to call a timeout and rethink their strategy. Following the second timeout the Lady Mustangs clawed to within 11-10 and forced the Lady Astros to call a timeout of their own. The Lynchburg girls traded volleys and serves with their opponent but eventually pulled out the 15-13 set win and secured the match 3-2. “For the first two sets it was a collective colossal failure and I think after the final three it was a collective team effort on getting the win,” said Faust. Lynchburg-Clay will host the Lady Greyhounds of Manchester on Thursday in a Southern Hills Athletic COnference matchup. https://www.timesgazette.com/wp-content/uploads/sites/33/2018/08/web1_LC-Volleyball-vs-EC.jpgLynchburg-Clay’s Brooklyn Layman jumps into the air to hit the ball on Tuesday at Lynchburg-Clay High School where the Lady Mustangs took on the Lady Astros of East Clinton.